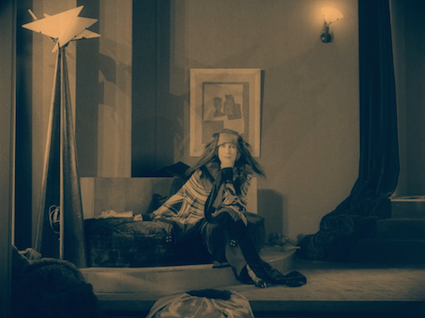 In an era when film audiences were so engaged that they might get into a brawl decrying or defending a new work of cinema, Marcel L'Herbier's L'Inhumaine ("The Inhuman Woman") left an indelible mark on quite a few viewers (and movie theaters) in 1924. What's most fascinating about the reported riots that the film incited is that, unlike similar incidents sparked by the anti-religious, anti-bourgeois flick L'Age d'Or, these dust-ups were purely over aesthetic concerns. The conflict essentially boiled down to: is this trendy claptrap or real art? Battles like this continue to rage in film buff circles over the value of certain filmmakers, but can you envision a modern viewer being so impassioned in his opinion of Wes Anderson or the Wachowskis that it came to blows? More than ninety years after its initial release, it seems nearly impossible to consider L'Inhumaine anything other than an artistic triumph. Every frame is overstuffed with visual delights thanks to L'Herbier's decision to incorporate the latest ideas in visual art, decorative art, architecture, high fashion, cinematography, and editing in his production. It was the vanguard of Art Deco before the term "Art Deco" was even coined. A few sculptures by cubist Joseph Csaky can be glimpsed in a few scenes. The main set designer was Alberto Cavalcanti, who later went on to direct films for Ealing Studios, including the famous war story Went the Day Well? and the horror anthology Dead of Night. Fernand Léger, the artist who is possibly best known now for co-directing the classic short film Ballet Mécanique, created a wild, whirring, not-at-all-practical mad scientist laboratory that ties in to the climax of the film. As one might expect in a work with so much focus on the visual design, the story is pretty simple. Not thin, just... simple. Acclaimed soprano Georgette Leblanc stars as Claire Lescot, a beloved opera diva pursued by dozens of male suitors, none of whom can melt her icy heart. In the unforgettable opening section of the film, Claire invites a selection of these men -- poets, scholars, businessmen, even a maharajah -- to a lavish soiree at her impossibly stylish home. Overseen by masked servants and highlighted by an outlandish gymnastic performance, it's quite an event. Claire announces to her assembled guests that she intends to disappear from the public eye and travel the world alone, unless she finds "something" to keep her in Paris. Each of the men assume that they have the je ne sais quoi to make Claire stay put, but only one of them does: imaginative, sensitive engineer Einar Norsen (Jaque Catelain). When Einar realizes the romantic game Claire is playing by stringing all these men along, he storms out of the party and blindly drives his car off a cliff. Though she is affected by Einar's suicide, Claire refuses to postpone a performance she has the next day, and ends up inspiring a riot in the audience as concertgoers argue whether or not she is inhuman and unfeeling. If that doesn't beat all, Claire must next wrestle with the true nature of her feelings when the possibility arises that Einar is not truly dead. Georgette Leblanc was in her mid-50s when she took on the role of Claire, but she looks a decade or two younger. Unfortunately, Jaque Catelain looks like a dewy-eyed baby for most of the film. This visual contrast makes their romance a little hard to buy -- arguably the film's only real weakness -- even though both actors deliver fine, stylized but emotional performances. Leblanc is particularly able to convey complicated emotions, as evidenced by a somewhat spooky scene in which Claire thinks she is about to be confronted by Einar's mangled corpse, only to have something quite different revealed to her. 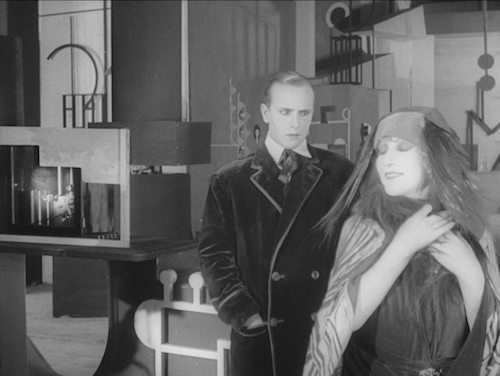 Even though detractors aren't wrong when they say L'Inhumaine has a story that was old-fashioned even in 1924, the film is remarkably forward-looking not only in its visual design, but also in some of its larger ideas. The most noteworthy example of this is Einar's invention of television (a few years before the crude early versions of TV actually existed), which he hopes to use to bring people around the world together. 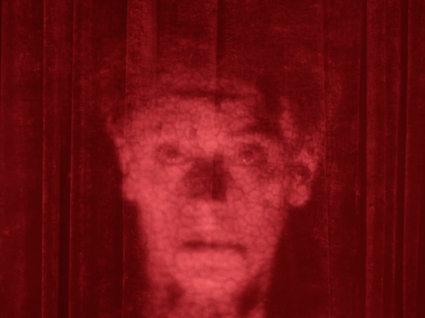 One could argue that Einar's plan for his invention anticipates not just television but also the internet. 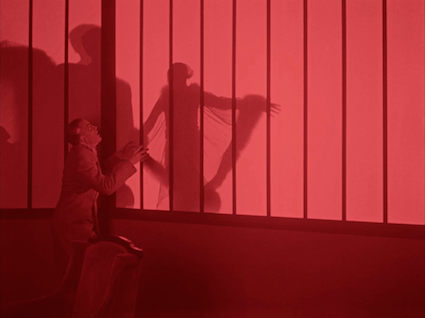 The Blu-ray is packaged with a booklet featuring production photos, a biographical piece on Marcel L'Herbier, a contemporaneous review of L'Inhumaine when it was released in 1924, and a note on the use of color tinting. This is a glorious rebirth for L'Inhumaine. This excellent AVC-encoded 1080p 1.33:1 transfer is based on a new 4K remaster that also restores the original color tinting, not seen for around ninety years. There's a little wear and tear now and again, but for the most part, this is a jaw-droppingly clean and crisp presentation. If I had to grumble about anything, it's that sometimes the grain in darker areas appears to resolve in a way that looks more like digital noise than film grain, but I bet only the most eagle-eyed viewers would even notice what I'm talking about. Flicker Alley offers two different musical scores, both offered in LPCM 2.0 stereo. 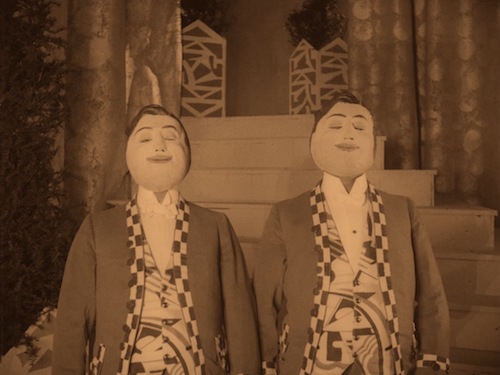 Neither choice is a "traditional" silent movie score: Aidje Tafial's ensemble performs a mix of gypsy jazz, string-based pop, and avant noise while the Alloy Orchestra offers an offbeat synth-based take on an orchestral score. I personally preferred the Tafial score, but both are satisfying accompaniments. The film features French intertitles with optional English subtitles. Behind the Scenes of L'Inhumaine (HD, 15:09) - An interesting, entertaining, but too short examination of the production of L'Inhumaine including never-before-seen outtakes. About the Recording of Aidje Tafial's Music (HD, 18:19) - A stylish-looking (although weirdly sound-edited) featurette on the recording of the new soundtrack. Tafial explains his concepts and approaches for composing and arranging the music, and we get to see him leading a small group of musicians through the recording sessions. An unparalleled, unrelenting feast for the eyes. With a new 4K remaster, this landmark of art cinema has been reinvigorated and reborn. DVD Talk Collector Series.